To have a free online access to ITJ, EUROTAS member needs first to register on web: http://www.itiedizioni.com/index.php/iti-eurotas-member and follow the instruction. Transpersonal psychology has brought new cartographies and a new understanding of the human psyche (thanks to Grof, Wilber, and others). This has made a considerable contribution to the way we understand the field of psychology. Today, the challenge is no longer only to achieve personal well-being, and to become enlightened as individuals. We are facing a much more important challenge: the survival of our species and the planet. We have to wake up, we have to act individually for a collective purpose. In this process, the transpersonal movement has a role to play. We have to expand beyond our practices and become active in the outer world. Today, transpersonal values are no longer an option but an obligation. The old thinking patterns are not valid anymore. They have created and now amplify the problems we must face in the world. In this time of transition, we see more and more creative initiatives based on solidarity, sustainability, sharing and education that are signs of a global transformation of our societies. But nothing will really change if we continue to stay in an ego-based psychology. We cannot transform the world outside if we don’t start from inside. Our personal transformation is the first step toward collective action, because we are the world. Transpersonal Psychology, Social Awareness, Global Transformation, Spiritual psychotherapy, Happy globalization, Humanistic politics..
Pier luigi lattuada, m.d., Ph.D. 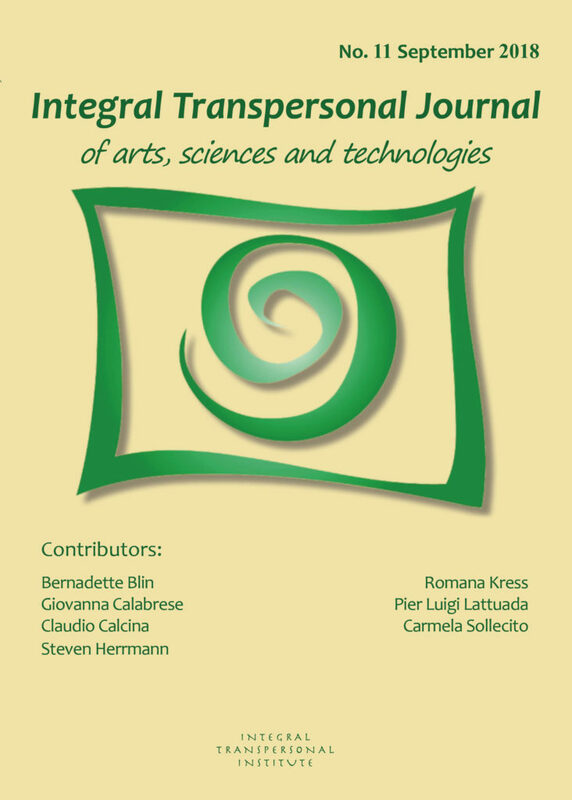 In this article, the author will discuss the specificities of transpersonal psychology, exploring how can offer an enormous potential to psychological science, encouraging it to widen its field of application and methods. In doing so the author will offer both some of the answers to the criticism by mainstream psychology, and those ontological and epistemological aspects on which it is based. romana kress, Dr. Scient. Pth. In this essay the author gives a concise overview of the use of the word transpersonal in the life and writings of the Israeli Jungian analyst, Erich Neumann, who was born in Berlin Germany in 1905 and lived from 1934 until his untimely death, in 1960, in Tel Aviv. The paper provides readers with an overview of the correspondence that took place between Neumann and Jung from 1934-1959 and traces the way in which the word transpersonal was used in their mutual efforts to map out the terrain of the human psyche. What is made clear in the paper is that while Jung remained within the epistemological limits of empirical psychology in his theory of the collective unconscious, Neumann attempted to extend Jung’s epistemology into metaphysical territory, and in so doing he charted out a structural diagram of the psyche that extends beyond the archetypal field, to what he called the Self-field. The Self-field, Neumann argued, is a necessary postulate to include it in any complete inventory of depth-psychology that attempts to reach a new Weltanschauung. His attempts to extend Jung’s hypothesis of the Self into transpersonal territory began in his 1948 Eranos lecture in Ascona, Switzerland, “Mystical Man”. His calling from the Self led Neumann to venture forth a postulate of what he called a “New Ethic” for the field of depth-psychology as a whole. A distinction is made between the personal and archetypal shadow and evil, and the “Voice” Neumann refers to as part of the Transpersonal Self. The essay concludes saying it is tragic Neumann died at so young an age of 55, before he could formulate further how his Ethic related to his metaphysic. Neumann was the first Jungian analyst to present the world with a truly transpersonal theory of the Self that the author sees as essential reading for any transpersonal pedagogue who attempts to place Jungians in the history of the Integral movement. Mystical man, numinous, Godhead, transpersonal, field-knowledge, Voice, Self-field, Wholeness, New Ethic, archetypal shadow, evil. The authors report about a clinical study conducted to evaluate the efficacy of Biotransenergetica, a transpersonal psychotherapy approach, in a general practitioner office. In addiction to prove the efficacy of Biotransenergetica this study demonstrates that there is no ostracism or rejection when research is conducted with rigorous methods. (This study will be published as a full article in International Journal Transpersonal Research). Transpersonal Psychotherapy, Biotransenergetica, Clinical research Studies, Anxiety, Depression. Tagged with: Absolute Anthropic anthropoecology breathe butterfly caterpillar complexity consciousness creativity Crisis death difference diversity ecosystem Epistemology existential condition extended mind health holism Humanistic psychiatry individuation pathology quantum physics. relative Self spiritual democracy subconscious self Subliminal Door superconscious. transformation. transpersonal transpersonal unconscious transpersonal values universe.